So I get a lot of questions from readers, some from the comments, and some by email, but the MOST asked question is where do I get my inspiration? Today I'll give you a bit of a glimpse of where and how I arrive on a design. lol (It's a short one today, I promise) As I sat down to do my nails for today, I was at a loss for what to paint. I racked and racked my brain, yet nothing came, so I looked to the list for inspiration, and stopped upon the idea submitted to me by reader Ada C., Hot Air Balloons! :) This got wheels turning, and reminded me of air shows and hot air balloon shows that I went to in Battle Creek, MI when I was a kid with my parents. There were literally HUNDREDS of hot air balloons in every size and shape imaginable - one was even shaped like a slice of cake! :) Anyway, everyone in Michigan knows (as do those who are avid cereal eaters) that Battle Creek, MI is the home of Kellogg's! Then I thought to myself...'Self, What do you think of when you think of Kellogg's?' and then I answered myself...'Tony the Tiger!' 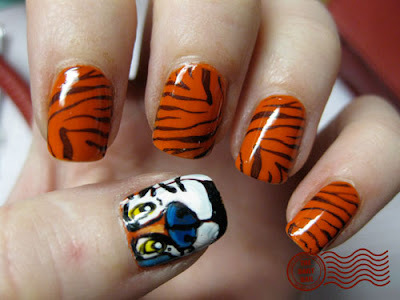 and thus, Tony the Tiger nails were born. I used Urban Outfitters Orange 2 as a base for all nails, with Zoya Raven applied with Konad Plate m57 for the Tiger print nails. For the Tony nail, I used Sally Hansen All the White Stuff for the white, Pure Ice French Kiss for the nose, and then mixed with white for the highlighting. For the highlighting on the nose, I mixed Urban Outfitters Orange 2 with Diamond Cosmetics #319 Lemon Yellow Zest, which I also used for the eyes. Diamond Cosmetics Giddy was used for shading on the white parts of the face, and Zoya Raven was used for all black line work. For the background color, I used Zoya Yummy. :) Topped it off with 2 coats of Seche Vite top coat, so they don't get soggy in milk. Lovely and adorable nails as always! So very creative; thanks for sharing the inspiration process with us. they are ggggrrrreeeaaatttt!!! (Isn't that how Tony says it??) So cute - Love the face!! Tony's face looks amazing!! I'm amazed that you're able to get such detail on that small nail...talent I tell ya! OMG! Ada C. THATS ME! Tony's face is just perfect.I would be able to recognize it, even if I didn't know what the theme was about. Oh battle creek how I love you and your cereal! Next up snowmobiles and cherries. OMG Tony is SO well done!!! How long does an average painting session take? You seem so busy! And, also, I mean no offense - but are those your real nails? Thanks, and great nails, as usual! Phenomenal rendition of the favourite commercialized Tiger! I think you made Kellogg's proud. That is SOOOOO cute. And he's PERFECT! You are SO talented! Rosey- Yes, I Really DO paint them every day!! :) I paint them before I go to bed for the next day. That face is amazing. I don't understand!!!!! OMG! That looks so cute! I really want to do nail art, do you think www.jacava.com would be a good website to get some from? I want to put stickers and stuff like that on! I must say I appreciate this blog, it entails useful information. Thank you for sharing.